The search has been on for several years for a replacement for the (now no longer produced) Proporta Pocket Power, an all in one, no cables needed, truly credit card sized emergency charger - and, right up at the premium end of the market we now have a candidate, offering full 2A output and able to deliver around 700mAh at 5V in about 20 minutes. While only around a one third charge for today's smartphones, that this fits unobtrusively in your wallet in a card slot makes this a terrific (if slightly pricey) accessory to get you to the end of a long day. Coming in deluxe packaging, with extras, it's also just about the perfect gift for a smartphone owner, as I explore below. The problem with smartphones is that their batteries are rarely high enough in capacity if you really push them, e.g. with camera, GPS and games. Which of us hasn't run out of power by tea-time on such days? The problem with portable chargers are that they're usually quite bulky, and even the smallest also usually require you to carry around a separate cable to link the charger with the phone. And even when charging, there's something dangling from your device. A specific problem with the smallest chargers is that they typically output at 500mA or, at most, 1A at 5V, meaning that their top-up powers take a while to transfer into the phone, meaning that you have to live with the phone and gadget dangling from it for an hour or so. 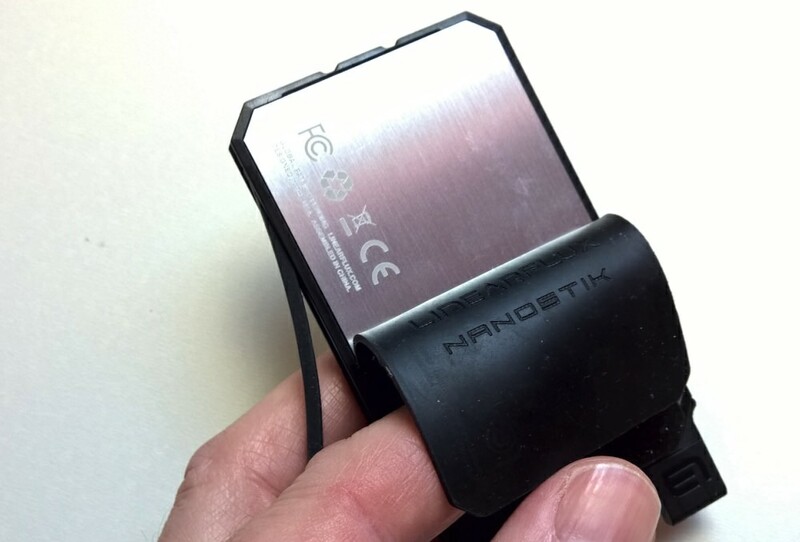 Even the smallest emergency chargers take up too much space to be kept in your wallet, meaning pocket space is gone or, worse, that you forget to take it with you in the first place. 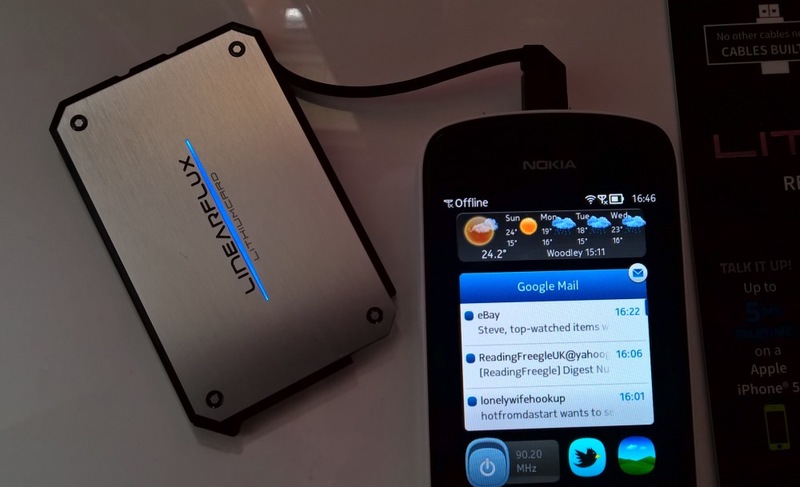 Up until now the nearest thing to solving at least some of these issues was the aforementioned Proporta Pocket Power, tiny, thin and with a flying lead that folds out to plug into a microUSB compatible phone. You then charged up the Pocket Power later on by plugging in a standard microUSB cable. The only flies in the ointment being that the capacity was quite low (quoted at '680mAh', meaning around 480mAh at 5V, delivered) and that, more critically, Proporta stopped selling them. And I've never found a direct equivalent from any other source. 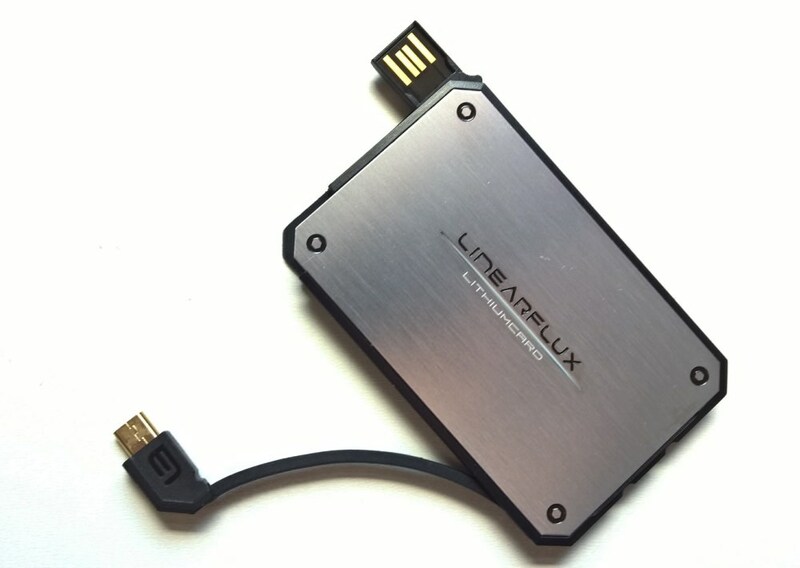 Almost exactly the same physical size as the Pocket Power, the LithiumCard, from LinearFlux, was unveiled back in February and I now have a couple of samples, one for microUSB and one for Apple/Lightning compatibility (shown immediately below, though the microUSB one is shown thereafter). Each is available in silver or gold aluminium, another hint that we're aiming at a premium product here. Capacity (despite the size, it really does fit easily into a wallet card slot) is quoted at '1200mAh'. This is around 40% more than that in the original Pocket Power and with no size penalty, which is pretty impressive. Of course, as usual with all portable chargers, the quoted amount is at 3.7V, the voltage of the battery itself. At 5V output, it can potentially deliver 900mAh - though see the next point for a slight caveat. Output current is 2A - this is very high for such a small unit. The original Pocket Power was rated at 600mA, so this is a big improvement. 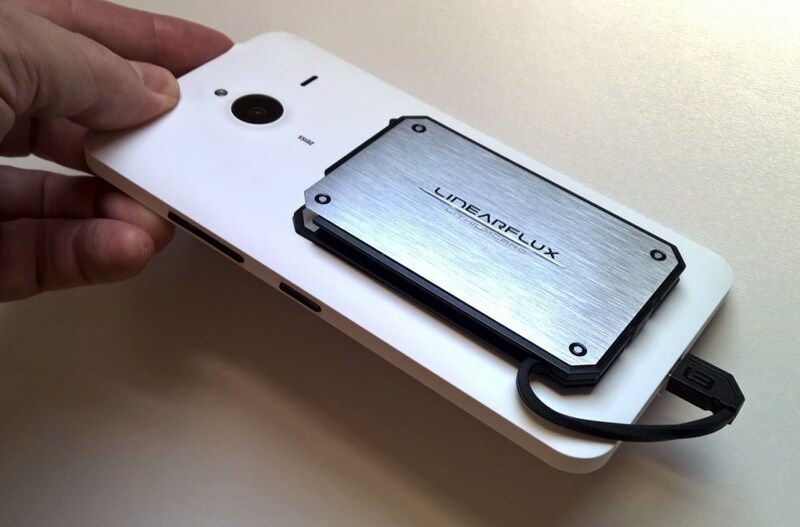 In testing, the LithiumCard was able to deliver all its charge into a high end smartphone in around 20 minutes, which is as fast as a traditional mains wall charger would have performed. (Albeit not up to the very high QuickCharge 2.0 tech that's creeping into the top end now.) As you might expect, taking 2 Amps from a solid state battery for 20 minutes generated quite a bit of heat as well, the LithiumCard got up to about 60°C, and as a result some energy is lost from such a transfer. The effective delivered charge at 5V, measured on several phones, was in the region of 700mAh. In addition to its main flying microUSB (or Lightning) lead being built-in (as shown, above), charging the LithiumCard is done via the full size USB male connector, which swivels out from the opposite corner (shown a couple of bullet points below). This, again, eliminates the need for a(nother) cable - you can just plug the card into any convenient USB port, whether on a mains charger, hub, laptop or car 12V system. While charging or discharging, the strip LED that runs classily across the front surface is used to indicate what's going on. Under charge, it's a flashing (and bright) white, under discharge it changes to blue for the 10%-90% range (shown above), and then red for under 10%, to indicate that it's running out. In my tests, charging the LithiumCard took around 40 minutes to recharge completely, from a 2A mains charger, slightly longer than the theoretical half an hour. Like the best portcable chargers, there's support for charging the Lithium card while it's simultaneously charging a smartphone. Meaning that you can pick up your phone and card after a while and know that both are charged. It also comes with a rather lovely 'NanoStik' non-stick pad - this is claimed to use 'advanced nanosuction' and works brilliantly. The idea is to use this, more or less permanently attached to the LithiumCard, and then when needed, the card will 'stick' to your smartphone. Or at least it will if your device hasn't got a tectured or curved back! I'm not sure the NanoStik works any better than any other non-slip pad, but the inclusion is still welcome. It only 'sticks' to smooth surfaces, so in the wallet or pocket it doesn't gather too much fluff, by the way. When dirty, you can wash it under a tap, as you would any other mat. Whether you use this is up to you, but the inclusion does add value and, again, helps make this a great gift. Charging only starts, in fact the internal voltage is only checked, when the main 'on' button is pressed. Most other recent chargers I've seen auto-activate when you plug something in, but there's something reassuring about having to press a button. Rather than some circuits being 'always on' and monitoring ports for chargeable devices, activation here is under your control. 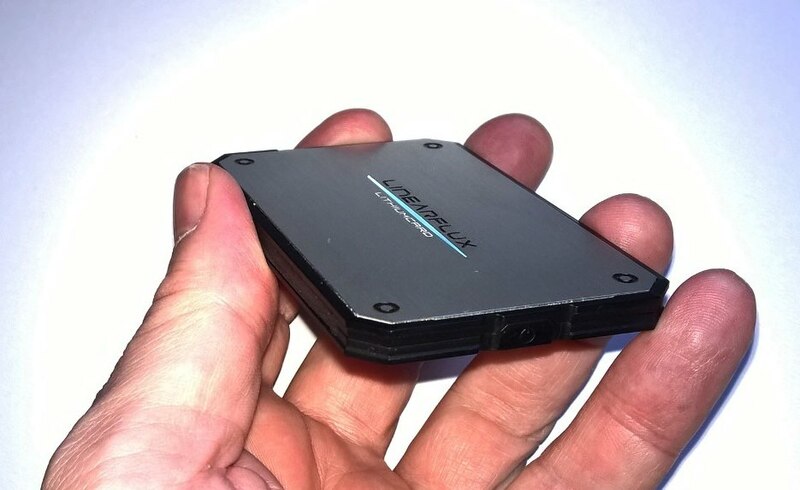 The LithiumCard is beautifully made, with etched aluminium top and bottom surfaces, and a toughened plastic rim to absorb any knocks. Now, 700mAh delivered may not seem like much, but on a typical test Nokia 808 PureView, at 33%, it was taken to 88%. Next, my test Lumia 1020, was down to 10% at 4pm, but the LithiumCard got it back to just under 50% in around half an hour, both limited in charging speed by the older phone hardware, not by the card. But in both cases, enough to head out for the evening and still have a functioning camera/smartphone. So file this, as with the Pocket Power, as an 'emergency charger', certainly. The diminutive size and lack of separate cables are the key, really, meaning that you can put it (charged) in your wallet and, quite literally, forget about it for weeks, even months on end. Then, when needed, it's always on you, since your wallet's always on you. The question of value for money is appropriate, of course. This is undoubtedly an expensive accessory, at £30 in the UK, but it's well within 'gift' territory - maybe give it yourself after a particularly good month at work, or with birthday money? That is, if someone hasn't given one to you in the meantime! PS. 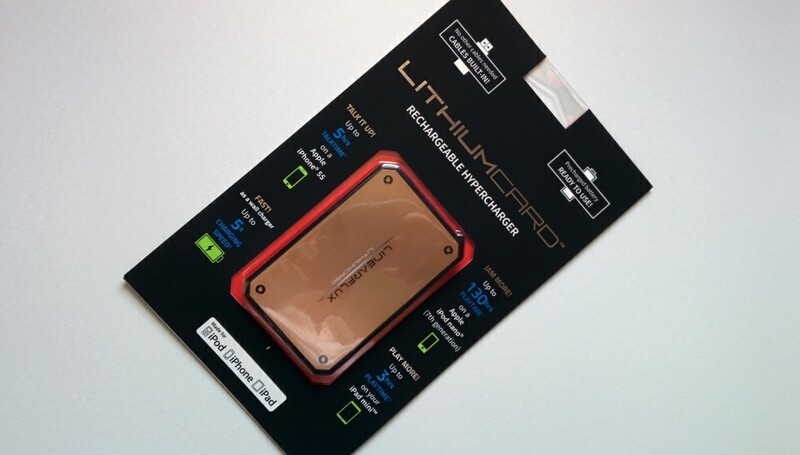 Thanks to MobileFun for the review samples, here's their full LithiumCard wallet charger range. PPS. If you need more information than supplied above or from MobileFun, then note that there's a glossy official site for the accessory too.